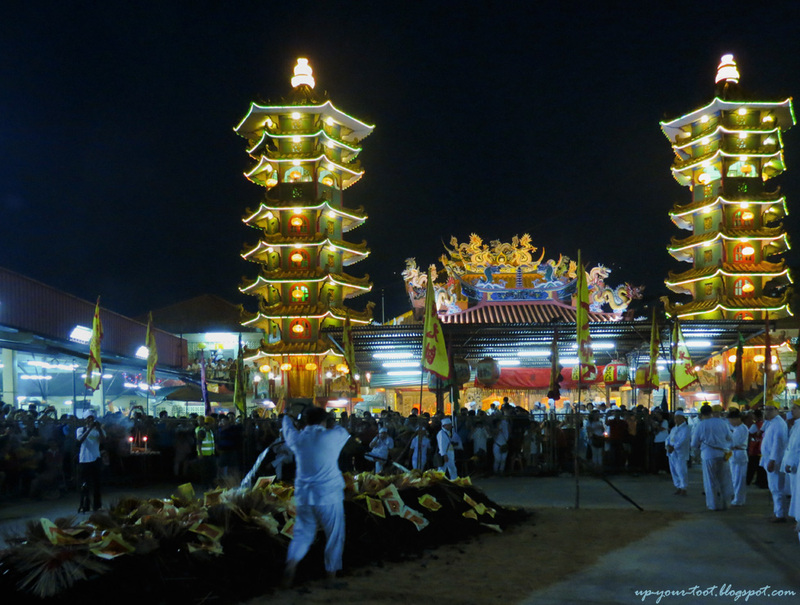 The ninth day of the Nine Emperor Gods Festival is the busiest day for the Ampang Nan Tian Gong Temple. The entire day and night is packed with events and preparation. Firstly, the midday will see another feeding of the heavenly soldiers’ session. 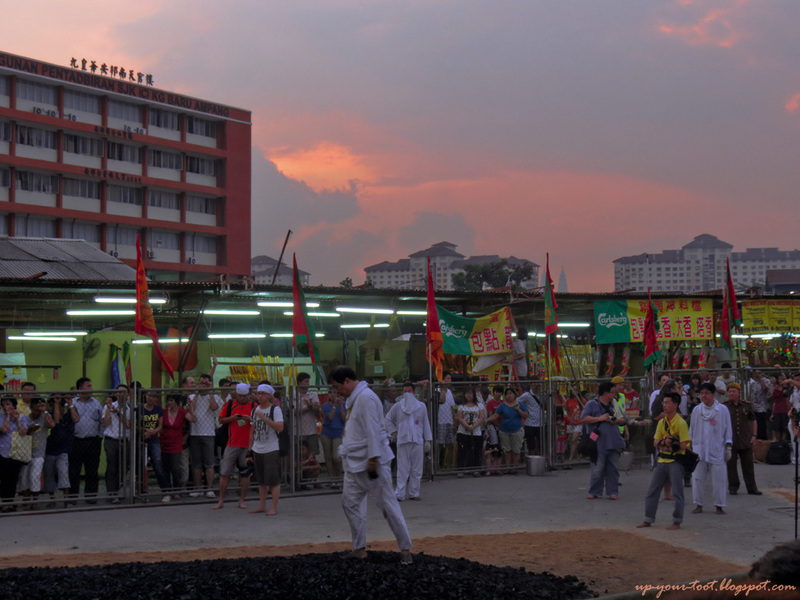 Next is the bed preparation for the fire walking/crossing later tonight. After that, they will have the round and round prayers and then prayers to confirm the time for the send-off. 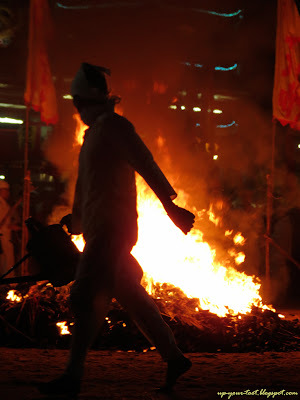 As the fire-walking also involves a large number of devotees from within the temple as well as those from other temples, it adds up to the huge logistics that needs to sorted out. 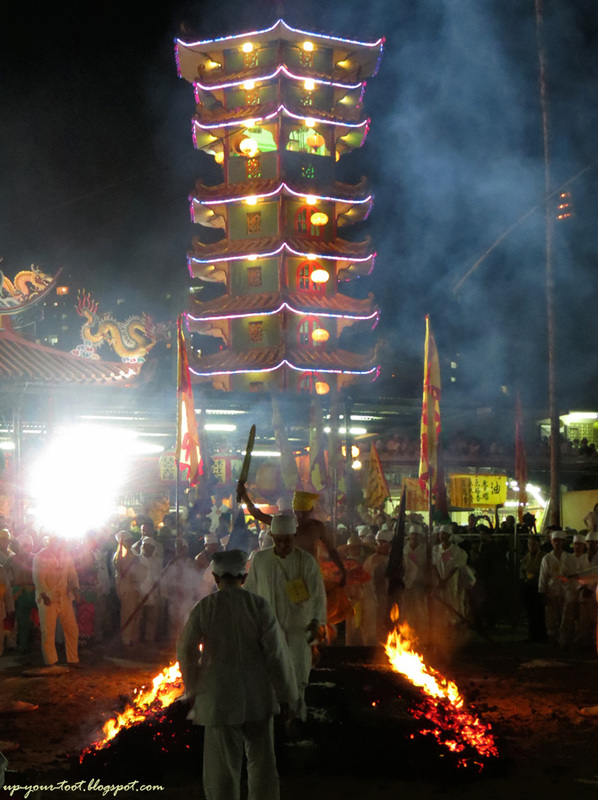 A storm threatened to wash out the fire walking ceremony. 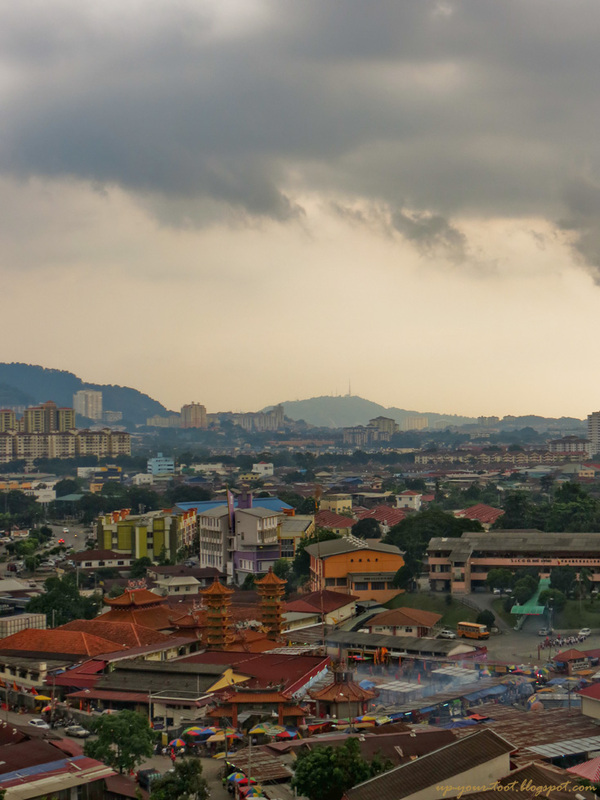 Luckily, the clouds just rolled by and all we got was a rumble of thunder here and there. Mdm. Ho and some of the temple committee staff were busy getting the number tags for the devotees ready when I went into the office to collect my press pass. After getting my press pass (it felt like I could walk on fire), I went for a quick vegetarian lunch. The area for the fire-walking had been cleared of stalls and fences that keep spectators out had already been set up around this area. 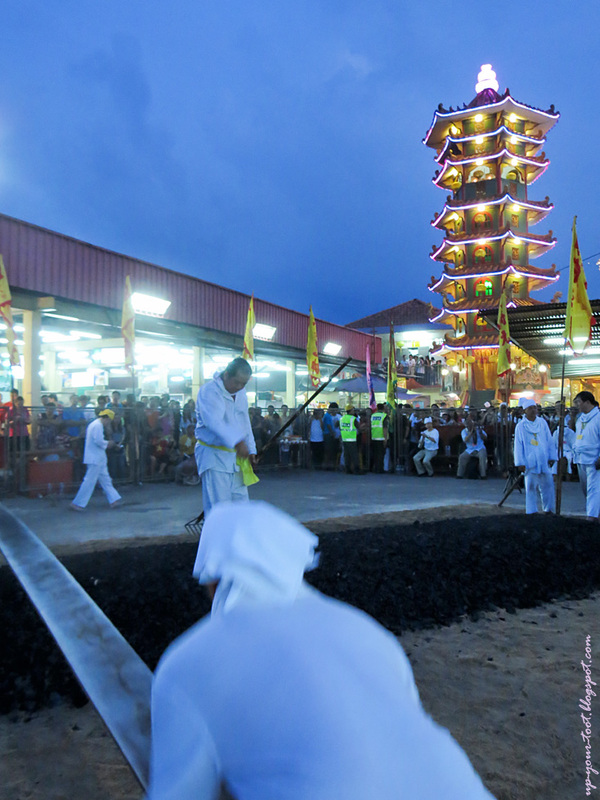 This is what you need to DIY a fire walking ceremony - sand, charcoal and lots of manpower. Sprinkle in some kerosene and lots of foolhardiness. As the sun sets, the charcoal bed slowly rises...It takes a lot of effort to ensure that the charcoal bed is properly compacted. Inside this area, a bed of sand serves as the base of the charcoal walkway that would be slowly built up for the fire walking. Later in the afternoon, a group of men would take bags of charcoal and lay it on top of this sand bed. The charcoal would be pounded and compacted before even more charcoal was added to the existing layer. This process is repeated until a compact bed of charcoal is formed. Adding more charcoal to the charcoal bed - the process is done under the watchful eyes of an expert. Hah! You missed a spot. His sharp eyes ensures that the bed is well-compacted and easy on the feet of the fire-walkers during the fire crossing ceremony. Up yours... Actually he is telling the guy in charge that he will pull the bags of charcoal up to empty its contents onto the bed. 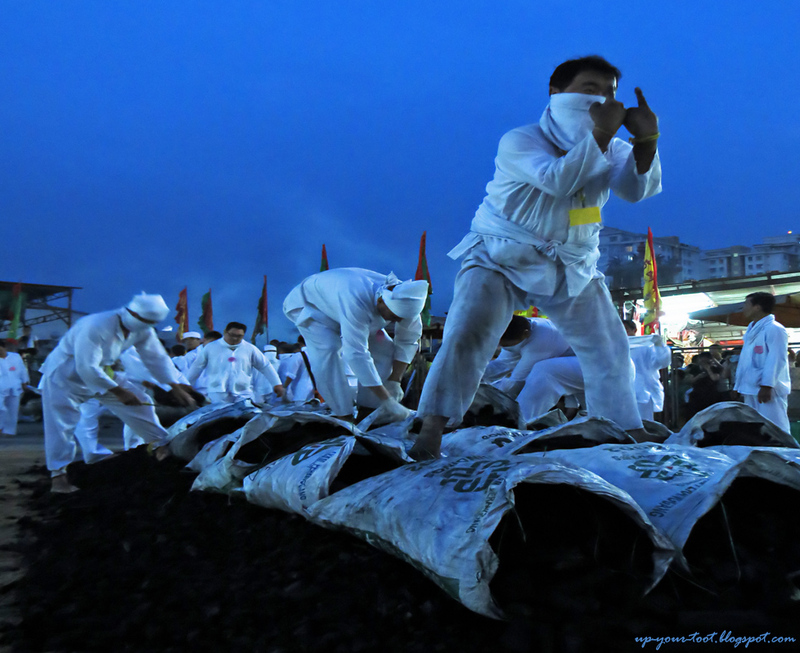 This is the last batch of charcoal and they have been building up the bed since 5.30pm in the afternoon. After the fingers up in the previous photo, he seems to be saying "And f@#k you too!" He was checking to see if there were anymore bags of charcoal left. As darkness falls, four altars were set up within the fence area at four cardinal locations. 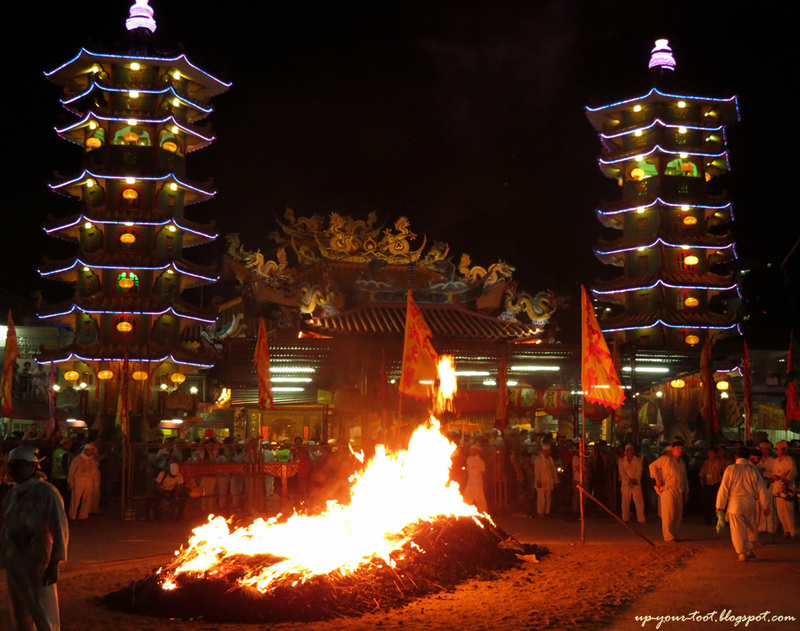 The charcoal bed is then covered with joss-sticks, joss papers and doused liberally with kerosene. At 8pm sharp, the signal for the pit to be set ablaze was given. 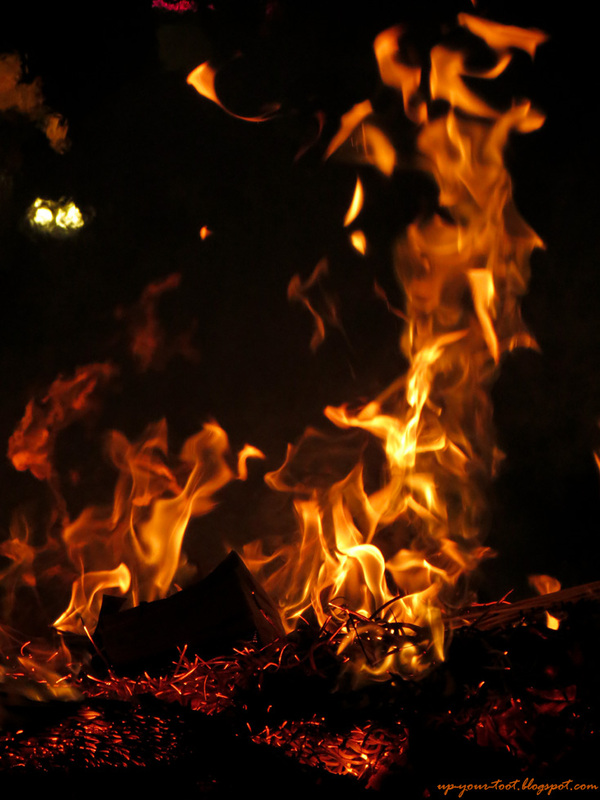 The flames from the pit leapt and danced, especially when more kerosene was poured onto the fire, fuelling the fiery flames. Adding fuel to the fire. 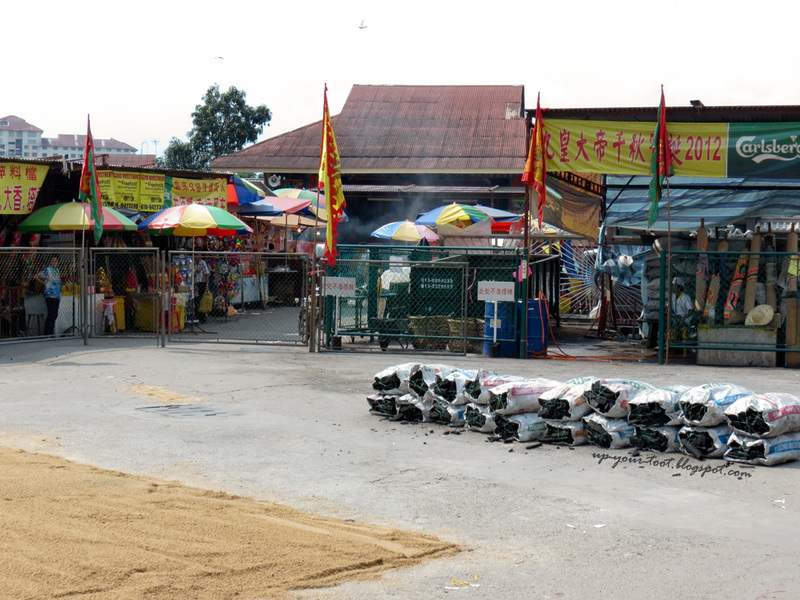 Joss paper, joss-sticks and a liberal dose of kerosene for the charcoal bed. We didn't start the fire...it was him with the kerosene in the watering can. Fire, fire burning bright...Kerosene is added intermittently to sustain the flames. Call the police, I caught the arsonist on camera running away from the scene of the crime. Oh, you mean you wanted him to set it on fire?? Once the charcoals were glowing hot, the central portion was tempered with a mixture of salt, tea leaves and rice. 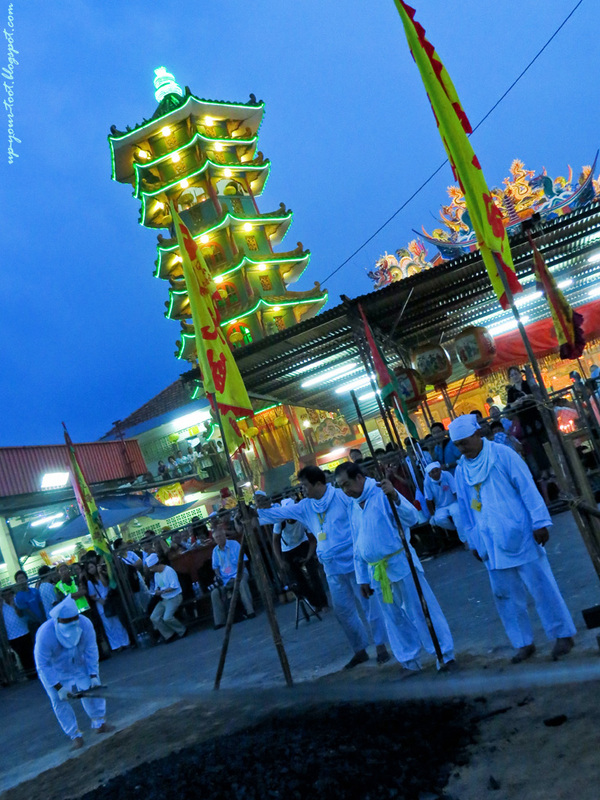 This allows for the safe passage of devotees during the ‘fire walking’ ceremony. 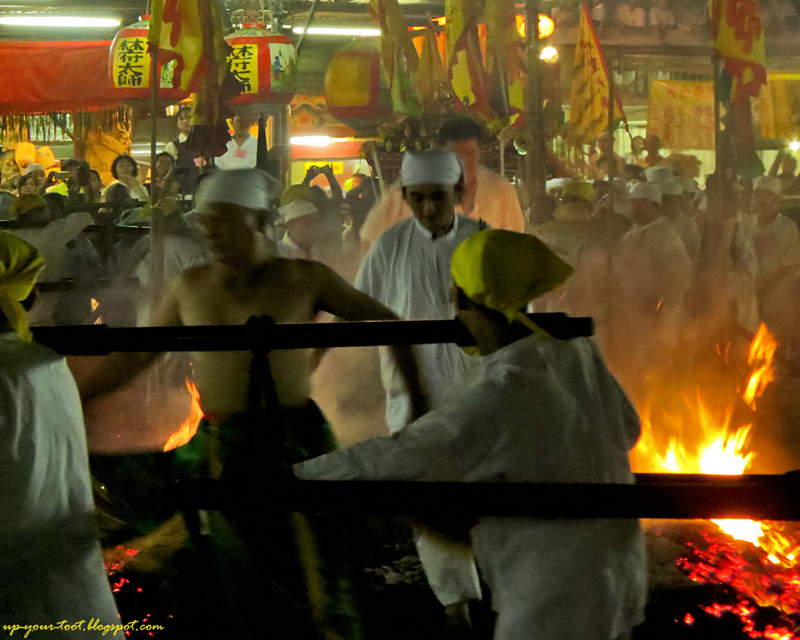 The first to go through the pit are the temple priests, followed by the mediums and the sedan chairs. 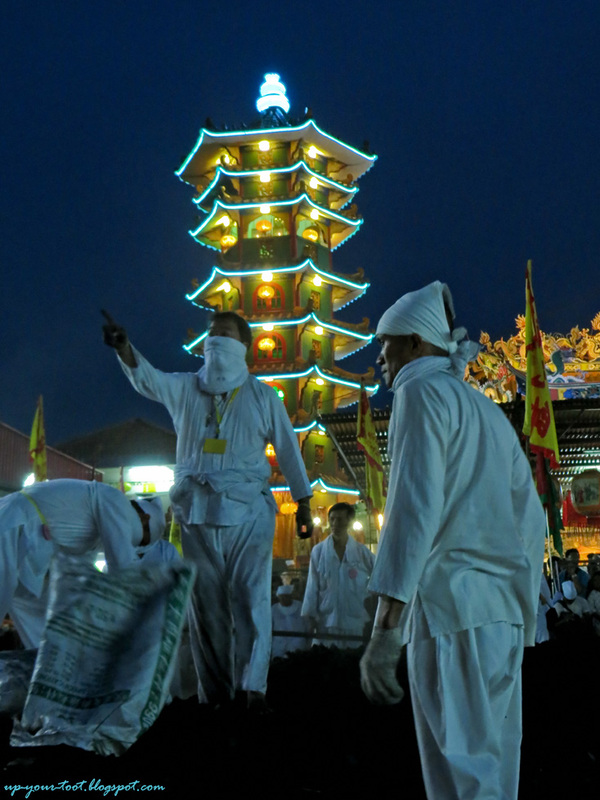 After that, devotees in white go through, carrying with them all sorts of personal items as well as deities from the temple. Hmm, can I say that this scene reminds me of She-Ra, with the pagoda being Crystal Palace. The medium has a sword in his hand and wears a mini skirt like-robe, which is totally so She-Ra. 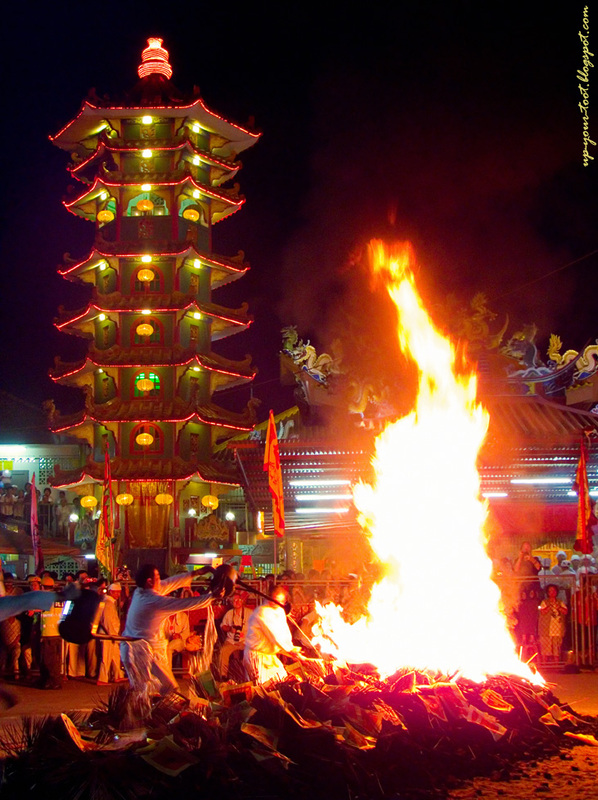 The medium in trance crossing the fire pit after the Taoist priest had done so. 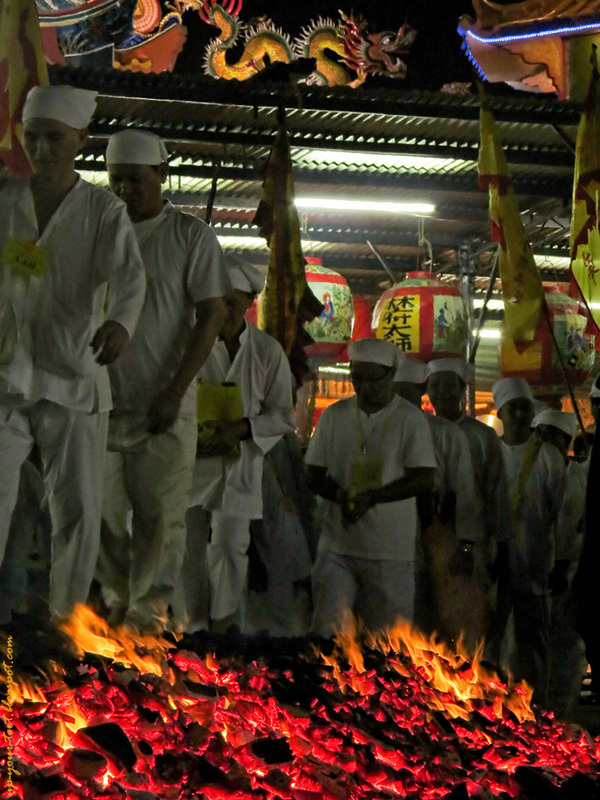 After the initial crossing of the fire by the mediums in trance, the sedan chair and their bearers cross the fire several times. 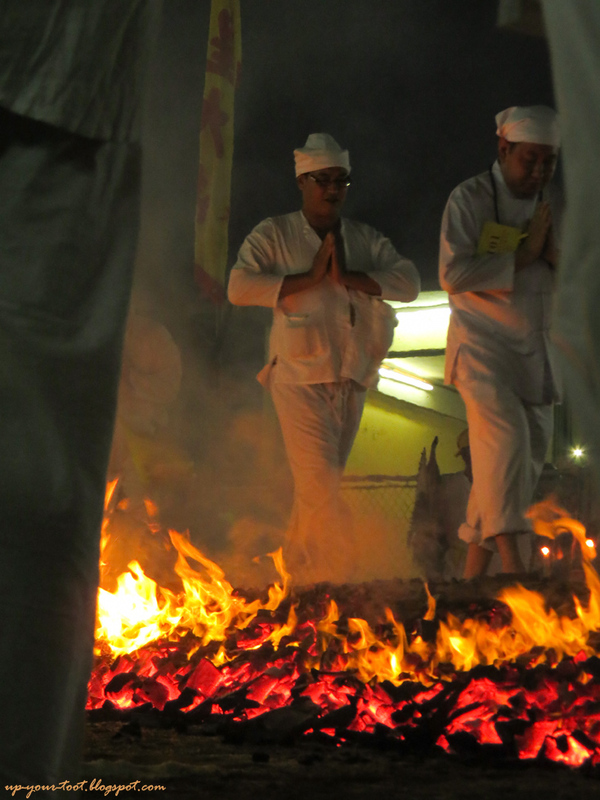 Mind over matter, mind over pain - devotees crossing the fire, protected by faith. Look ma, no hands...A devotee having an epiphany of sorts whilst crossing the fire pit. Perhaps he just realised that the charcoal is hot! Move aside South Park and the Asses of Fire trilogy, here's Kow Ong Yea with Feet of Flames... It looks like their feet are on fire, when they are actually walking on the cooler parts of the bed. One two take off shoes, three four walk the pit, five six burn my feet... Those embers look angry. 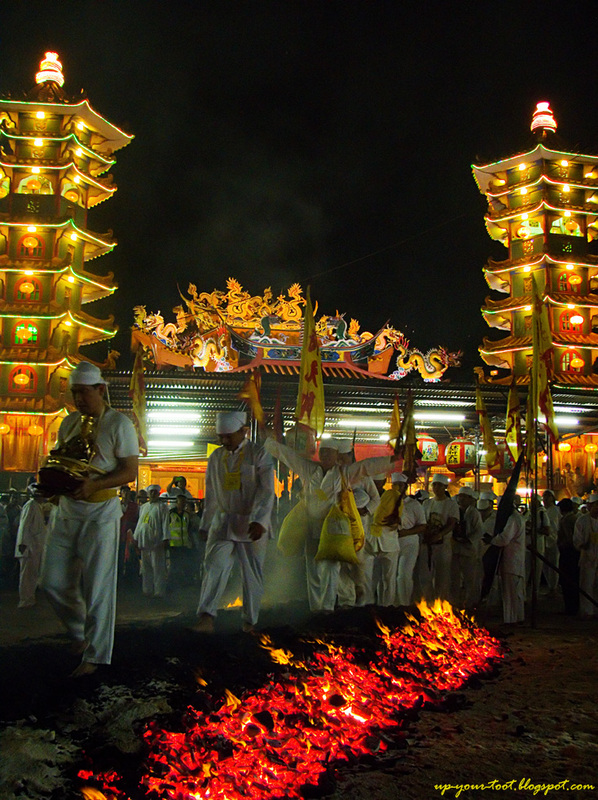 When all who should cross the fire had done so, more joss-sticks, joss paper and kerosene were added to the glowing charcoal bed, causing flames to leap and dance to the delight of spectators for the second time. 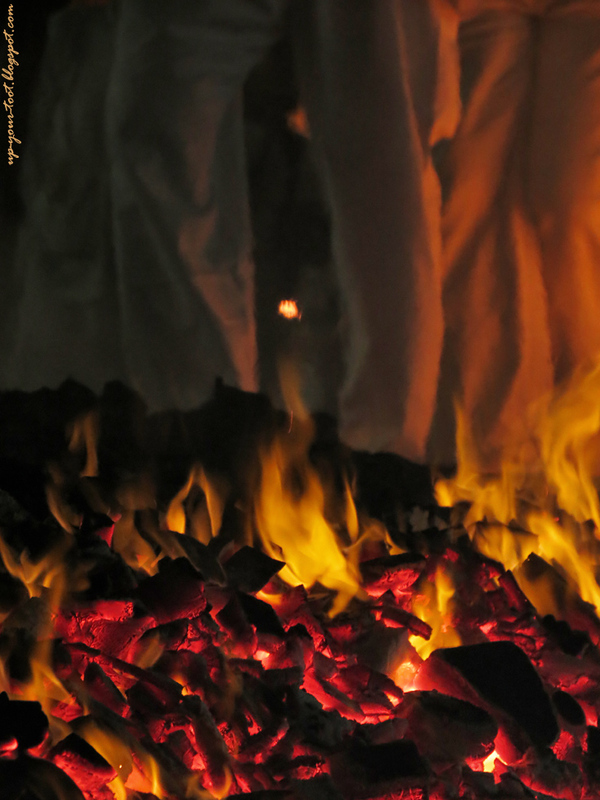 The fiery tongue of flames from the charcoal pit. 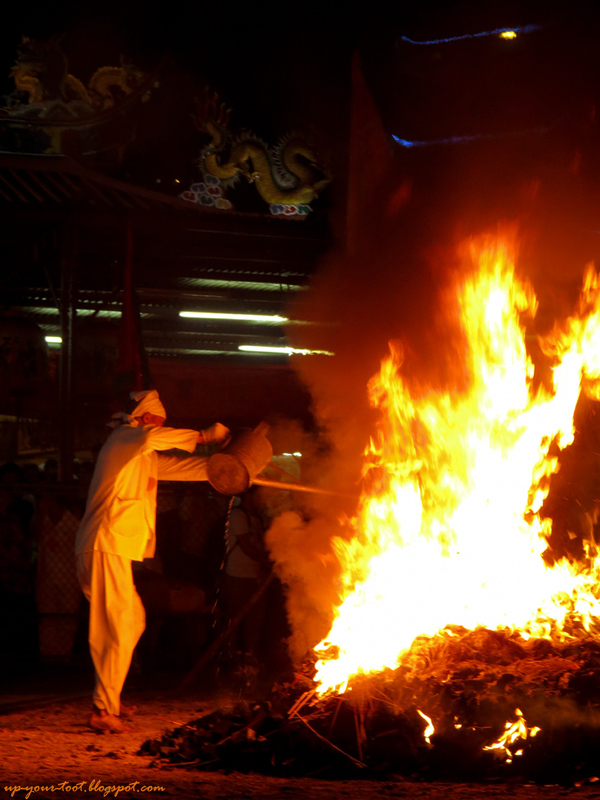 You can see the burning joss-sticks and boxes of joss paper that were added to the pit after the crossing was over. If you are going to watch this ceremony next year, it pays to be an early bird and pick a good location for yourself. Specifically, the two sides parallel to the charcoal bed offer better view. The end section only provides you with either people’s bum walking into the fire bed or people’s crotch front coming out of the fire walk. The Round and Round ceremony is posted in a following post (see links below) as this post is already too picture heavy.